Leleu & Gomez Alfaro is a boutique law firm providing legal representation in immigration, and business law for corporations, technology startups, individuals, and families. We’re committed to seeking innovative ways to push the boundaries of the law for the benefit of our clients while being true to our core values. The law firm was founded on the principles of integrity, diversity, and, above all, our dedication to legal excellence. Each of our partners embodies those values. As immigrants ourselves, we bring a unique global perspective to your case and will be personally invested in your outcome. Luis Gomez Alfaro is an immigration-litigator and also provides counsel to clients coming to the United States. As a U.S. immigration attorney, Luis has represented clients in over three hundred immigration court proceedings. He has appeared before immigration courts in Atlanta, Baltimore, Boston, Buffalo, Chicago, Cleveland, El Paso, Hartford, Newark, New York City and the Board of Immigration Appeals. Luis has also practiced in Mexico, Argentina and Brazil. 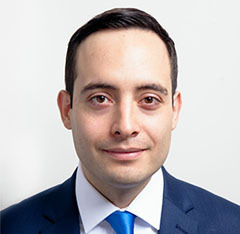 Luis is a Juris Doctor graduate of the University of Illinois College of Law, a graduate of ITESO University College of Law (Mexico) and of the São Paulo Law School (Brazil). Luis speaks Spanish, English and Portuguese. He is admitted to the New York Bar, licensed to practice in Mexico and is a member of the American Immigration Lawyers Association. Luis is an active and outspoken member of the Latino community in New York City and has made numerous appearance in local and national media outlets. He is also a well-known advocate of New York’s LGBTQ immigrant community. Luis is regularly scheduled for radio and television interviews regarding the immigration system in the United States and the requirements to navigate the ever-changing immigration requirements. Adrien N. Leleu is a founding partner of the law firm and specializes in Immigration Law. He represents corporate and individual clients in complex and routine U.S. immigration matters. Adrien’s practice includes investor’s visas, employment-based visas and immigration support for corporate restructuring. He also regularly appears before Immigration Courts, the Board of Immigration Appeals and at the USCIS. Adrien is a native of Brittany, France where he earned a law degree from Versailles Law School. He subsequently started his career in Paris working for international law firms Adrien’s’ distinct background uniquely positions him to effectively advise French and EU-based entrepreneurs and start-ups in their operations in the U.S.
Adrien received a LL.M. from NYU School of Law in 2013 with a concentration in International Litigation. He is fluent in French, English and Spanish. In addition, Adrien is a recipient of the prestigious Fulbright scholarship, honoring individuals who have made extraordinary contributions toward bringing peoples, cultures, or nations to greater understanding of others. 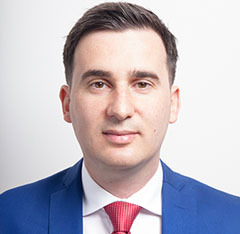 Dan joined the Battiloro Law Group as an associate in 2014 after representing clients in commercial and residential real estate lending, regulatory compliance, and other matters.Dan graduated from Providence College in 2007 with a degree in English, and later graduated from Touro Law Center in 2011. Mr. Pfeifer also served as an IRS-certified Tax Volunteer for the Volunteer Income Tax Assistance Program (VITA), and served as judicial intern to Court Attorney Referee Jeffrey A. Grob in the Nassau County Matrimonial Center. Thomas Gearon is an experienced trial attorney who has successfully recovered millions of dollars in damages on behalf of workers injured by their employers’ negligence and personal injury victims in both state and federal courts, including a $36 million recovery on behalf New York Police Sergeants. As a retired member of the NYPD and a member of the New York State Trial Lawyers Association, Thomas has the skills, experience, and proven track record to work towards a successful resolution of your injury suit.